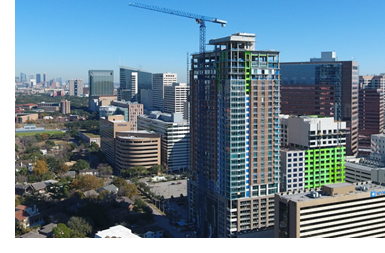 ​​​​​​​​​​ HOUSTON – Medistar is developing an apartment, LATITUDE Med Center, in partnership with Greystar. The project features a 35-story apartment tower, 400 units, range of 349-sf micro-units to 3,767-sf penthouses, tenth floor amenity deck, rooftop infinity pool, and six-level parking garage. It will be located adjacent to the Texas Medical Center off Fannin St. The development is currently under construction and scheduled for completion in third quarter 2018.